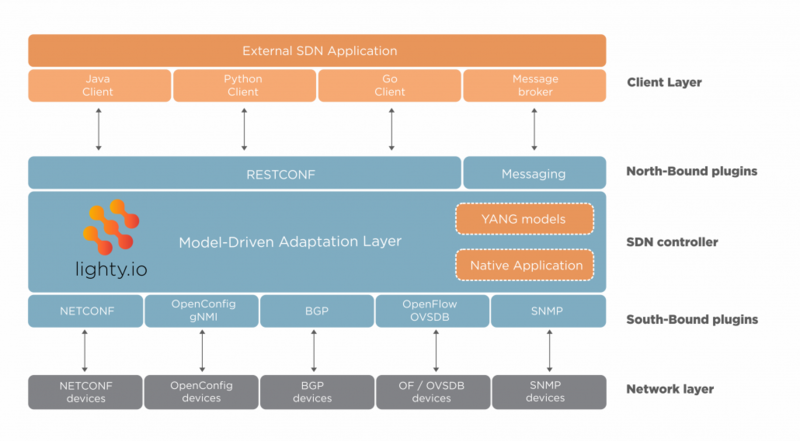 PANTHEON.tech has recently published an example application of an SDN controller, using RESTCONF Northbound module and OVSDB + OpenFlow Southbound modules. In this blog we are going to describe, how to use the SDN controller with an Open vSwitch instance running in OpenStack. Open vSwitch is open source virtual switch which uses OVSDB (Open vSwitch Database) and OVSDB management protocol for management of virtual OpenFlow switches referred to as bridges. The bridges are configurable by OpenFlow protocol according to OpenFlow switch specification. We have already written a blog about OpenFlow protocol and its support by lighty.io. There’s also example SDN controller application called lighty-community-restconf-ofp-app. It utilizes RESTCONF northbound module and OpenFlow southbound module only. You can find it at our GitHub repository. In this blog, we will show you some example setup and sequence of requests using both OVSDB and OpenFlow protocols implemented as SB modules in lighty.io. We have published an example SDN controller called lighty-community-restconf-ovsdb-app, which utilizes RESTCONF northbound module and OVSDB southbound module only. You can check its README.md file and Postman collection for more details. The SDN controller is running on a machine with IP address 10.14.0.160 with RESTCONF NB plugin & opening Port 8888. Open vSwitch instance is running on a machine with IP address 10.14.0.103 (the same address used in ovs-vsctl command explained above) The tested instance has been set up by DevStack scripts but it can be any Open vSwitch instance running in OpenStack Network node, compute node or outside of OpenStack. Subsequent requests can be found in the repository at GitHub, in the form of Postman collection. In the README.md & in this blog, we are using a curl command to send the RESTCONF requests. We are also using the Python module json.tool for printing of JSON responses. The following piece of the ovs–vsctl show command output shows the initial configuration of the Open vSwitch and its state, where we can see that the Neutron service is connected as OVSDB manager (Manager “ptcp:6640:127.0.0.1”). The Neutron service is also configured as OpenFlow controller for the bridge br-tun (Controller “tcp:127.0.0.1:6633”) and br-tun is connected to the controller. Using this ovs-vsctl command we set up Open vSwitch to listen to second OVSDB manager connection at TCP port 6640 and an interface with IP address 10.14.0.103. The command keeps the configuration for Neutron service as OVSDB manager (ptcp:6640:127.0.0.1). The output of “ovs-vsctl show” command must be changed, as a result of the command above. There should be two managers configured, but only one of them is connected. The connected one is Neutron service and we have to start and configure the SDN controller, in order to initiate OVSDB connection from the controller’s side. This RESTCONF request results in OVSDB session initiation to the pre-configured OVSDB server in the Open vSwitch. You can check whether the session has been established using the “ovs-vsctl” show command. Both OVSDB managers should be connected now. You can also use the next RESTCONF request. Now, we are going to ask lighty.io (meaning the SDN controller) about the state of OVS. In this step, we are going to access the SDN controller through a RESTCONF request. The controller will then create a request via the OVSDB protocol and OVS will create the same request, as shown in OVS-VSCTL show. This RPC request returns the same data as an output of the ovs-vsctl show command. But the show command returns text output. In case of RPC request, the output is formatted as JSON or XML (depending on the Accept header) what is more appropriate for API between software layers of SDN solutions (i.e. : RPCs returning JSON or XML formatted output of commands are SDN ready). The example output of the request can be found here. Since there’s only one OVSDB topology node in the SDN controller, the output contains the same data as in case of the previous request. This request returns only a subset of data related to the bridge br-int. Here’s an example of the output, where you can find a node-id of the Open vSwitch instance. This can be used in subsequent requests. Here’s is the output from our example. This request uses node-id in the URL. The node-id can be found in reply to requests 8. and 9. For this setup, you can also use the OFM application, which provides GUI for management of OpenFlow switches. You can connect OFM to the controller and retrieve OpenFlow tables of a specific switch – plus the flows will be graphically displayed. You can also modify existing flows, or add new using OFM. See our blog about OpenFlow integration. In this blog, we have described the use of an SDN controller with OVSDB and OpenFlow support. It can be used to manage Open vSwitch virtual switches. We have used Open vSwitch running in an OpenStack environment and we described the sequence of requests needed to connect SDN controller to OVSDB and OpenFlow interfaces of Open vSwitch. This approach can be used to manage Open vSwitch instances, running in OpenStack Network nodes and Compute nodes without breaking the connection between Neutron service and the Open vSwitch instances. But the SDN controller example and described requests can be used with any virtual or physical network device supporting OpenFlow or OVSDB or both protocols. The usage of RESTCONF SB plugin in the SDN controller means, that any application can implement RESTCONF (HTTP/REST/API) client and communicate with the controller, as we have demonstrated by Postman application and OpenFlow manager (OFM) in the previous blog. 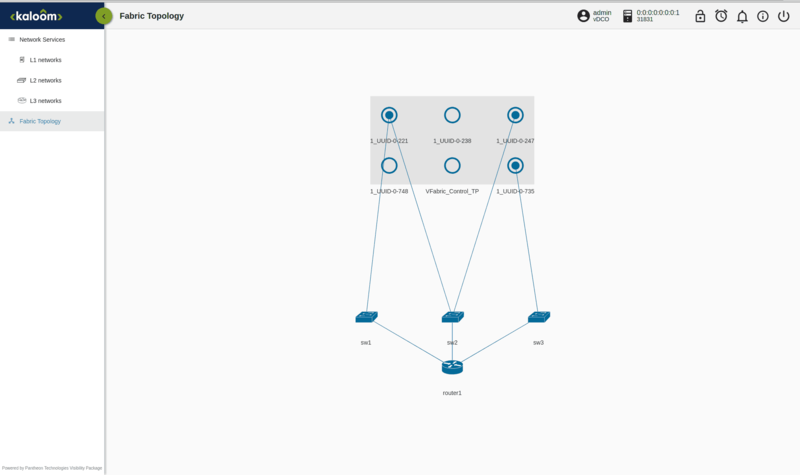 lighty.io 9.2.x provides examples of OVSDB & OpenFlow SDN controllers for integration with your SDN solution. Those examples will guide you through lighty.io controller core initialization, with OVSDB and/or OpenFlow southbound plugins attached. You can use those management protocols with really small memory footprint and simple runtime packaging. Today, we will show you how to run and integrate the OpenFlow plugin in lighty. In a virtual networking context, OF can be used to program virtual switches with tenant level segregation tags (for example VLANs). In the context of NFV, OF can be used to re-direct traffic to a chain of services. It is managed by the Open Networking Foundation. Why do we need OpenFlow? Routers and switches can achieve various (limited) levels of user programmability. However, engineers and managers need more than the limited functionality of this hardware. OpenFlow achieves consistent traffic management and engineering exactly for these needs. This is achieved by controlling the functions independently of the hardware used. PANTHEON.tech has managed to implement the OpenFlow plugin in lighty-core. Today, we will show you how you can run the plugin yourself. This will download all important dependencies and create .zip archive in ‘lighty-examples/lighty-community-restconf-ofp-app’ directory. The previous command will run the application with default configuration. In order to run it with a custom configuration, edit (or create new) JSON configuration file. Example of JSON configuration can be found in lighty-community-restconf-ofp-app-9.2.1-SNAPSHOT folder. An important configuration, which decides what can be changed, is stored in sampleConfigSingleNode.json. For applying all changes, we need to start OFP with this configuration as a Java parameter. Sending FLOW to config data-store. ForwardingRulesManager (FRM) is listening to the config-data store. When it’s changed. the config data store FRM will sync changes on the connected device, once available. Flow added this way is persistent. Sending a RPC message directly to device. This option works without FRM. When is device restarted, then this the configuration will disappear. In case you need to disable FRM, start OFP with an external configuration & set the enableForwardingRulesManager to false. Then, simply start OFP with this external configuration. RESTCONF configuration can be changed in the JSON config file sampleConfigSingleNode.json, mentioned above. It is possible to change the RESTCONF port, IP address or version of RESTCONF. Currently, the version of RESTCONF set to DRAFT_18, but it can be set to DRAFT_02. Firstly, start the OpenFlow example application. Make sure to read through this guide on how to install mininet. Next step is to start mininet, with at least one Open vSwitch (use version 2.2.0 and higher). For this explanation of OFP usage, RESTCONF is set to DRAFT_18. All RESTCONF calls used in this example can be imported from file OFP_postman_collection.json, in project resources to Postman. Let’s get information about the connected device. If you want to see all OFP inventory, use ‘get inventory‘ call from PostmanCollection. Now try to add table-miss flow, which will modify the switch to send all not-matched-packets to the controller via packet-in messages. This works the same as add flow. OFP will find openflow:1, table=0, flow=1 from url and update changes from the body. In order to create traffic, we need to setup topology behavior. There are three methods for flow table population (Reactive, Proactive, Hybrid). We encourage you to read more about their differences. In our example, we use Proactive flow installation, which means that we proactively create flows before traffic started. Next step is to create flows, that create a connection between switches. This will be managed by setting Matched and Action filed in Table 0. In this example, we connect two ports eth1 and eth2 in a switch together. So everything that comes from port eth1, is redirected to port eth2 and vice versa. 1. Add flow to switch s1 (named in OFP as ‘openflow:1’), which redirect all traffic that comes from port eth1 (in OFP named as ‘1’) to port eth2 (in OFP named as ‘2’). Wireshark is a popular network protocol analyzer. It lets you analyze everything that is happening in your network and is a necessity for network administrators and power-users alike. After it starts, double click on ‘any’ filter. Then, filter packets with ‘openflow_v4.type == 10‘. Now, the Wireshark environment setup will only show Packet-In messages from OpenFlow protocol. If everything is setup correctly, then we can see Packet-In messages showing up. In the below section for Java developers, there is an option for setting Packet-In Listener. This configuration set to log every Packet-In message as a TRACE log to console. When this is done, run mininet command ‘h2 ping h1’ again. If everything is set up correctly, then we can see Packet-In messages in logs. Java DevelopersSome configuration can be done in Java Main class from OpenFlow Protocol example. Packet handling is managed by adding a Packet Listener. In our example, we add the PacketInListener class, which will be logging packet-in messages. For a new packet listener class, it is important to have implemented the class “PacketProcessingListener”. The first step is to create an instance of PacketInListener (1 – in the window below). Then we will add OpenflowSouthboundPluginBuilder to this part of the code (2 – in the window below). NGINX is used to serve as a proxy server towards OFM application and ODL/lighty RESTCONF interface. Before NGINX starts, it is important to the switch NGINX config file in /etc/nginx/sites-enabled/ with the default file in the root of this project. In this default file, we have set up the NGINX port, port for RESTCONF and Grunt port. Please be sure that these ports are correct. All this information should be written in env.module.js file located in the directory ofm src/common/config. To run OFM standalone app on local web server, you can use tool Grunt. For this tool is everything prepared in the OFM repository. Grunt is installable via npm, the Node.js package manager.After running grunt and NGINX you can access OFM standalone app via web browser on used NGINX port typing URL localhost:9000. After running Grunt and NGINX, you can access OFM standalone app via a web browser on a used NGINX port by typing the URL localhost:9000. To see detailed device information, select those devices that you want to inspect. Then click on the main menu bar, at the top of “Flow management” section. Now, you should see device information and added Flows. In a Flow section, you can Add Flow by clicking on the pen on the left-top side of the table marked by an arrow. In the right side of table at each row, you can delete or update selected flow. Adding a flow can be done from the Flow management section by clicking on the pen, on the left-top side of Flow table. Here you can choose the switch, from where the flow should be sent. Then just click on the property that should be added in the flow, from the left menu. After filling all required fields, you can view your flow as a JSON message, by clicking on the “show preview” button. For sending flows to a switch, click on “Send message” button. To show statistics in the network click on the “Statistics” section in the main menu bar. Then, choose from the drop-down menu what statistic you want to see and click on “Refresh data” button. We have managed to integrate the whole OpenFlow plugin into lighty-core. This is the same way it is implemented in OpenDaylight, version Fluorine (SR1). It is, therefore, possible to use lighty-controller for managing network devices via the OpenFlow protocol. If you would like to see how our commercial version might benefit your business, please visit lighty.io for more information, or contact us here. 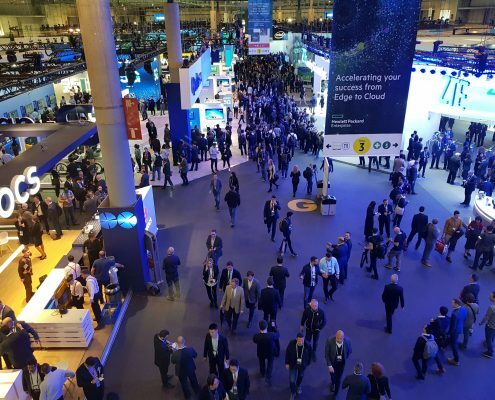 PANTHEON.tech‘s Denis Rasulev visited Barcelona for the annual Mobile World Conference in Barcelona. Here are his thoughts on the event. I was thrilled to visit MWC from the beginning. 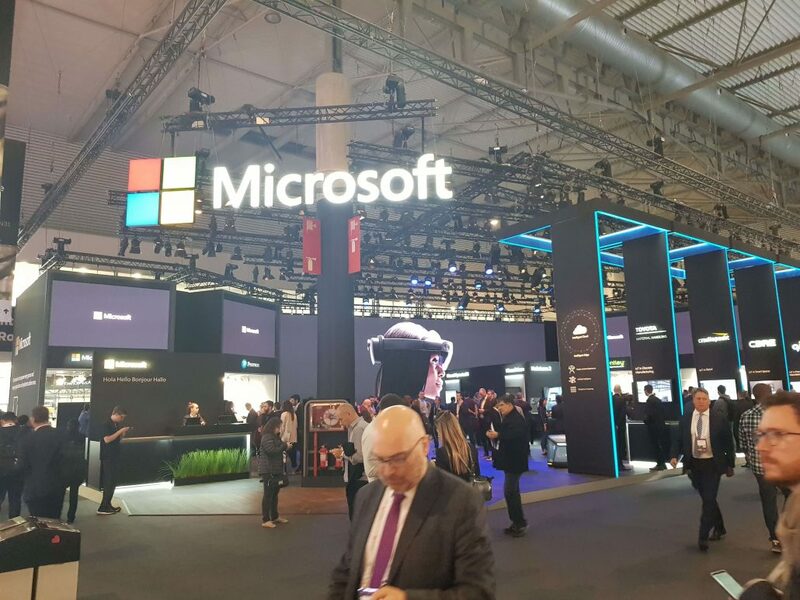 Such a huge and renowned event always shows the latest tech not only in the mobile sector. 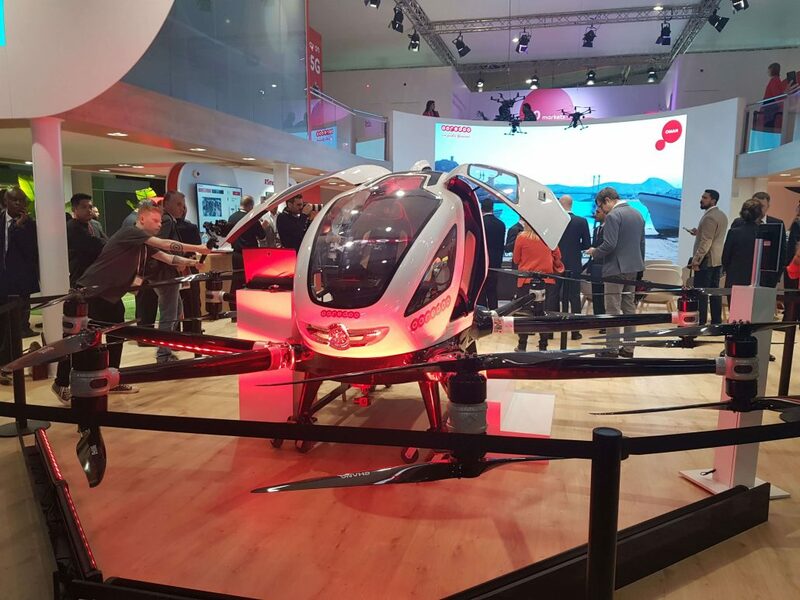 This years themes and keywords could be summarized to three cores: 5G, IoT & AI. First of all, I would like to point out how well the event was organized. I was greeted with my badge right at the airport, with directions towards the conference being provided by helpful volunteers. 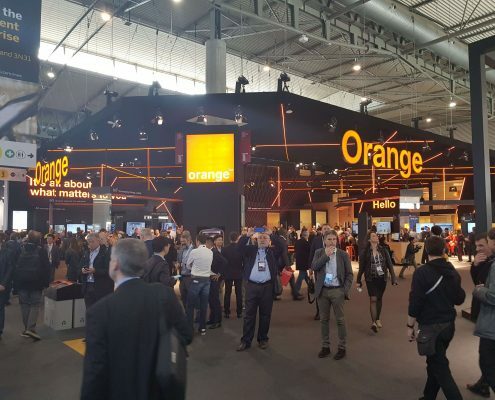 After settling in Barcelona, I set off to start my day early and arrive at the MWC at 8 AM. I have made 89,109 steps throughout MWC 2019. Some booths were both impressive and beautiful, either taking up several hundred square-meters of space. Some booths even had two floors, just to underline the massiveness of the event. The venue was packed with attendees since morning, but it was easy to talk to presenters and orientate in each pavilion. 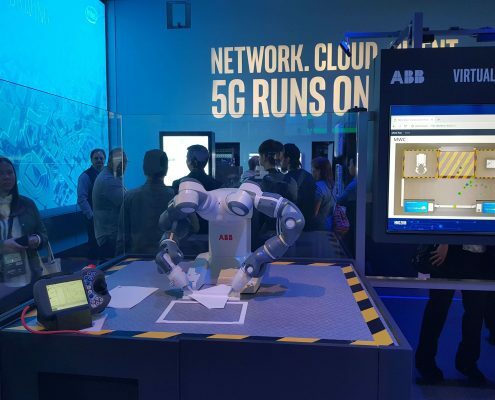 With each day and conference, we can feel that 5G is coming closer to consumers and real-life deployment. What seemed like a wild, unreal idea a few years ago is now on the way of dictating the future of each new technology. I saw remote road assistance which was possible due to lightning-fast 5G utilization. Healthcare could become fully automated or remotely controlled. Again, this is due to 5G coverage. I am glad, that PANTHEON.tech is making sure to stay on point of this revolution and keep up. There were prototypes of robots, which would make coffee shops with humans obsolete. It would take your order via voice recognition and prepare your order. Another robot has perfectly built paper-planes with inhumane precision. Some of these products seemed like a toy for playing around. But we have to remember that this is what makes greatness – testing, thinking out-of-the-box and creating a functional concept. It was wonderful to see, that startups had an opportunity to also present themselves. Not only to attendees, but to potential investors as well. I held the future in my hands, in form of the Barefoot Networks’ Toffino 2 chip. 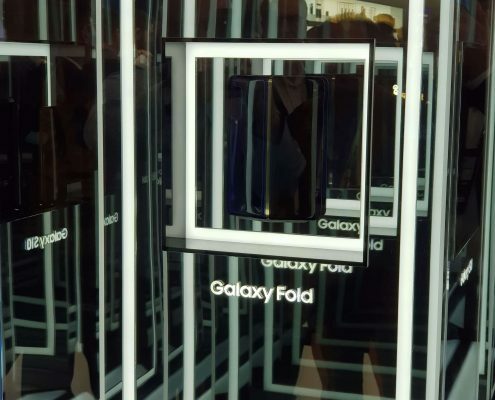 I was able to see the first functional, foldable phone by Samsung. But most importantly, I was able to see how the future will be shaped in the coming years. 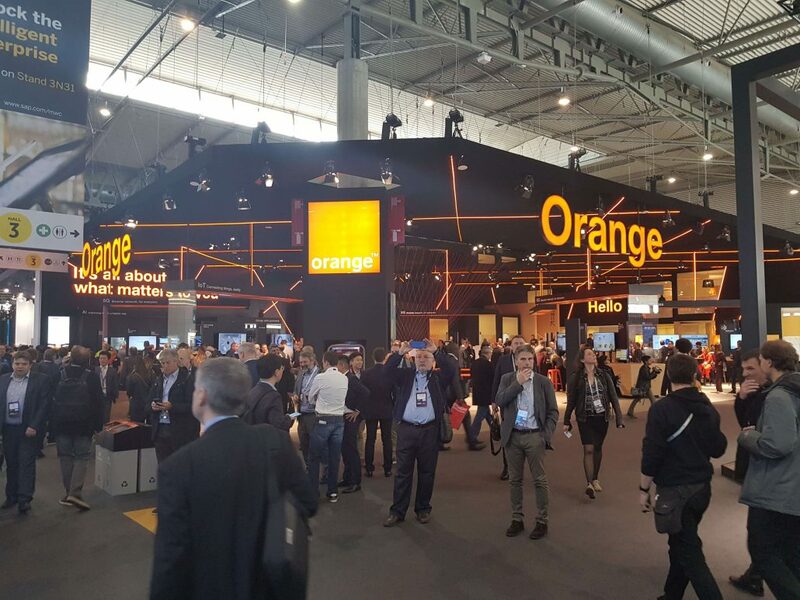 MWC is a must-go, powerful event with great networking opportunities. Trust me, you want to be there. 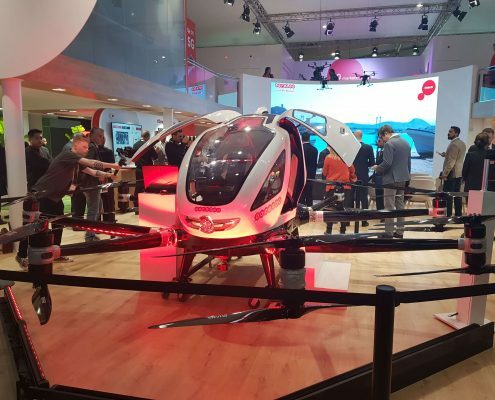 In the future, I will definitely require a larger team to cover more ground at the next Mobile World Conference. Hopefully, PANTHEON.tech will see you there! Welcome back to our Vector Packet Processing implementation guide, Part 4. Today, we will go through the essentials of gRPC and REST and introduce their core concepts, while introducing one missing functionality into our VPP build. This part will also introduce the open-source GoVPP, Go language bindings for binary API – VPP management. Natively, VPP does not include a gRPC / RESTful interface. PANTHEON.tech has developed an internal solution, which utilizes a gRPC-gateway to VPP, using GoVPP. It is called VPP-RPC, through which you can now connect to VPP using a REST client. In case you are interested in this solution, please contact us via our website or contact us at sales@pantheon.tech. gRPC (Remote Procedure Calls) is a remote procedure call (RPC) system initially developed by Google. It uses HTTP/2 for transport, protocol buffers as the interface description language, and provides features such as authentication, bidirectional streaming and flow control, blocking or non-blocking bindings, and cancellation and timeouts. It generates cross-platform client and server bindings for many programming-languages. gRPC-gateway (GRPC-GW) is a plugin of protobuf. It reads the gRPC service definition and generates a reverse-proxy server which translates a RESTful JSON API into gRPC. This server is generated according to custom options in your gRPC definition. VPP-RPC is our new RESTful VPP service. It utilizes gRPC & gRPC-gateway as 2 separate processes, in order to facilitate communication with VPP through GoVPP. gRPC gateway exposes the REST service, for which there is no built-in support in VPP. By using gRPC-gateway and gRPC server services, the VPP API is available through gRPC and REST at the same time. Both services use generated models from VPP binary APIs, therefore exposing both APIs is easy enough to include both. It is up to the user to choose, which mechanism they will use. VPP APIs are defined in /usr/share/VPP/api/ which is accessible after installing VPP. The Go package tap is a generated via the VPP Agent binary API of the ‘tap’ VPP module. It is generated from this file: tap.api.json. protoc’s go plugin will compile the proto file and create a gRPC stub tap.pb.go, containing client & server interfaces that define RPC methods and protobuf message structs. Vpp-rpc-implementor will generate the code that implements the TapServer interface – the actual RPC methods calling GoVPP APIs – in Tap.server.go file. protoc’s gRPC-gateway plugin will compile the proto file and create the reverse proxy tap.pb.gw.go. We don’t have to touch this file further. We provide a Postman collection within our service, which serves as a starting point for users with our solution. The collection created in the vpp-rpc repository, tests/vpp-rpc.postman_collection.json path, contains various requests and subsequent tests to the Tap module. Judging from the graph below, we see that most of the requests take well below the average mark. Profiling our solution, we’ve found the reason for the anomalies (above 10ms) to be caused by GoVPP itself when waiting on the reply from VPP. This behavior is well documented on GoVPP wiki. We can conclude our solution closely mirrors the performance of the synchronous GoVPP APIs. In conclusion, we have introduced ourselves to the concepts of gRPC and have run our VPP API + GoVPP build, with a REST service feature. 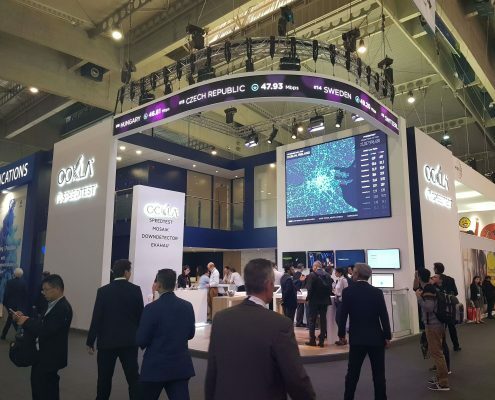 Furthermore, we have shown you our in-house solution VPP-RPC, which facilitates the connection between the API and GoVPP. If you would like to inquire about this solution, please contact us for more information. In the last part of this series, we will take a closer look at the gNMI service and how we can benefit from it. Welcome back to our guide on Vector Packet Processing. In today’s post number three from our VPP series, we will take a look at Ligato and the its VPP Agent. Ligato is one of multiple commercially supported technologies supported by PANTHEON.tech. A Virtual Network Function is a software implementation of a function. It runs on single or multiple Virtual Machines or Containers, on top of a hardware networking infrastructure. Individual functions of this network may be implemented or combined together, in order to create a complete networking communication service. A VNF can be used as a standalone entity or part of an SDN architecture. Its life-cycle is controlled by orchestration systems, such as the increasingly popular Kubernets. Cloud-native VNFs and their control/management plane can expose REST or gRPC APIs to external clients, communicate over a message bus or provide a cloud-friendly environment for deployment and usage. It can also support high-performance data planes, such as VPP. CN Infra – a Golang platform for developing cloud-native microservices. It can be used to develop any microservice, even though it was primarily designed for Virtual Network Function management/control plane agents. 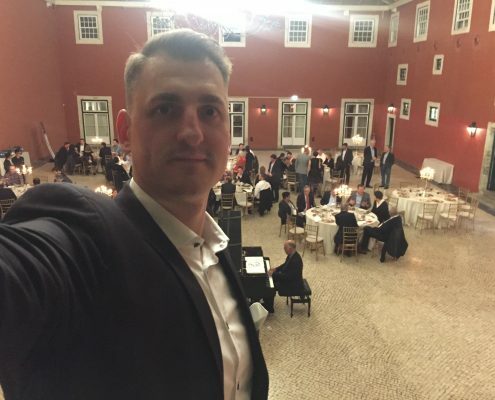 SFC Controller – an orchestration module for data-plane connectivity within cloud-native containers. These containers may be VPP-Agent enabled or communicate via veth interfaces. BGP Agent – a Border Gateway Protocol information provider. You can also view a Ligato demonstration done by PANTHEON.tech here. The platform is modular-based – new plugins provide new functionality. These plugins can be setup in layers, where each layer can form a new platform with different services at a higher layer plane. This approach mainly aims to create a management/control plane for VPP, with the addition of the VPP Agent. What is the VPP Agent? The VPP Agent is a set of VPP-specific plugins that interact with Ligato, in order to access services within the same cloud. VPP Agent provides VPP functionality to client apps through a VPP model-driven API. External and internal clients can access this API, if they are running on the same CN-Infra platform, within the same Linux process. For this example, we will work with the pre-built Docker image. For a detailed rundown of the Quickstart, please refer to the Quickstart section of VPP Agents Github. We have shown you how to integrate and quickstart the VPP Agent, on top of Ligato. Our next post will highlight gRPC/REST – until then, enjoy playing around with VPP Agent. Welcome to the second part of our VPP Introduction series, where we will talk about details of the Honeycomb project. Please visit our previous post on VPP Plugins & Binary API, which is used in Honeycomb to manage the VPP agent. Honeycomb is a generic, data plane management agent and provides a framework for building specialized agents. It exposes NETCONF, RESTCONF and BGP as northbound interfaces. Honeycomb runs several, highly functional sets of APIs, based in ODL, which are used to program the VPP platform. It leverages ODL’s existing tools and integrates several of its existing components (YANG Tools, MD-SAL, NETCONF/RESTCONF…). In other words – it is a light on resources, bare bone version of OpenDaylight. Its translation layer and data processing pipelines are classified as generic, which makes it extensible and usable not only as a VPP specific agent. For the purpose of integrating VPP with Honeycomb, we will further refer to the project hc2vpp, which was directly developed for VPP usage. This VPP specific build is called hc2vpp, which provides an interface (somewhere between a GUI and a CLI) for VPP. It runs on the same host as the VPP instance and allows to manage it off-the-box. This project is lead by Pantheons own Michal Čmarada. Honeycomb was created due to a need for configuring VPP via NETCONF/RESTCONF. During the time it was created, NETCONF/RESTCONF was provided by ODL. Therefore, Honeycomb is based on certain ODL tools (data-store, YANG Tools, others). ODL as such uses an enormous variety of tools. Honeycomb was created as a separate project, in order to create a smaller footprint. After its implementation, it exists as a separate server and starts these implementations from ODL. Later on, it was decided that Honeycomb should be split into a core instance, and hc2vpp would handle VPP related parts. The split also occurred, in order to provide the possibility of creating a proprietary device control agent. hc2vpp (Honeycomb to VPP) is a configuration agent, so that configurations can be sent via NETCONF/RESTCONF. It translates the configuration to low level APIs (called Binary APIs). For more information, please refer to the hc2vpp official project site. In the upcoming post, we will introduce you to the Ligato VPP Agent. In the first part of our new series, we will be building our first VPP platform plug-in, using basic examples. We will start with a first-dive into plugin creation and finish with introducing VAPI into this configuration. If you do not know what VPP is, please visit our introductory post regarding VPP and why you should consider using it. The principle of VPP is, that you can plugin a new graph node, adapt it to your networks purposes and run it right off the bat. Including a new plugin does not mean, you need to change your core-code with each new addition. Plugins can be either included in the processing graph, or they can be built outside the source tree and become an individual component in your build. Furthermore, this separation of plugins makes crashes a matter of a simple process restart, which does not require your whole build to be restarted because of one plugin failure. The easiest way how to create a new plugin that integrates with VPP, is to reuse the sample code at “src/examples/sample-plugin”. The sample code implements a trivial “macswap” algorithm that demonstrates the plugins run-time integration with the VPP graph hierarchy, API and CLI. #replace 'sample' with 'newplugin'. as always, take extra care with sed! node.c – implements functionality of this graph node (swap source and destination address) -update according to your requirements. newplugin.c, newplugin_test.c – implements plugin functionality, API handlers, etc. Update newplugin.api to define your API requests/replies. For more details see “API message creation” below. API messages are defined in *.api files – see src/vnet/devices/af_packet.api, src/vnet/ip/ip.api, etc. These API files are used to generate corresponding message handlers. There are two types of API messages – non-blocking and blocking. These messages are used to communicate with the VPP Engine to configure and modify data path processing. Non-blocking messages use one request and one reply message. Message replies can be auto-generated, or defined manually. Each request contains two mandatory fields – “client-index” and “context“, and each reply message contains mandatory fields – “context” and “retval“. Blocking messages use one request and series of replies defined in *.api file. Each request contains two mandatory fields – “client-index” and “context“, and each reply message contains mandatory field – “context“. Once you define a message in an API file, you have to define and implement the corresponding handlers for given request/reply message. These handlers are defined in one of component/plugin file and they use predefined naming – vl_api_…_t_handler – for each API message. Replies can be auto-generated or manually defined. In order to call the binary API, we will introduce VAPI to our configuration. VAPI is the high-level C/C++ binary API. Please refer to src/vpp-api/vapi/vapi_doc.md for details. We can use the following C++ code to call our new plugins’s binary API. Furthermore, you are encouraged to try the minimal VAPI example provided in vapi_minimal.zip. This example creates a loopback interface, assigns it an IPv4 address and then prints the address. Our next post will introduce and highlight the key reasons, why you should consider Honeycomb/hc2vpp in your VPP build. Explore our Pantheon GitHub. Follow us on Twitter. Welcome to our new series on how to build and program FD.io‘s Vector Packet Processing framework, also known as VPP. The name stems from VPP’s usage of vector processing, which can process multiple packets at a time with low latency. 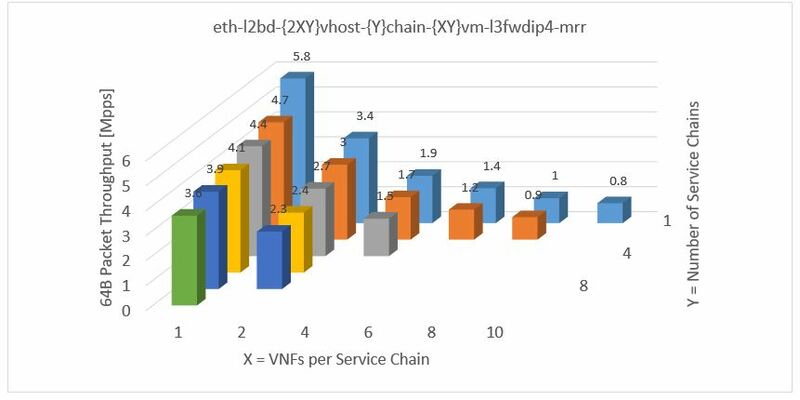 Single packet processing and high latency were a common occurrence in the older, scalar processing approach, which VPP aims to make obsolete. What will this series include? Why should I start using Vector Package Processing? For a full list of features, please visit the official Vector Package Processing Wiki.You can also check our previous installments on VPP integration. Enjoy and explore the repository as you wish. We will continue exploring the Binary API in the next part of our series. 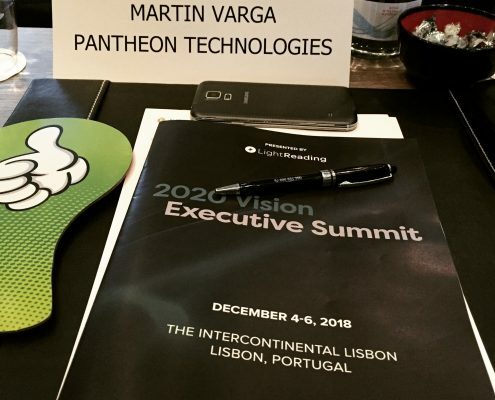 I was sent to Lisbon by PANTHEON.tech, in order to attend the annual 2020 Vision Executive Summit. Here are my experiences and insights into this event. 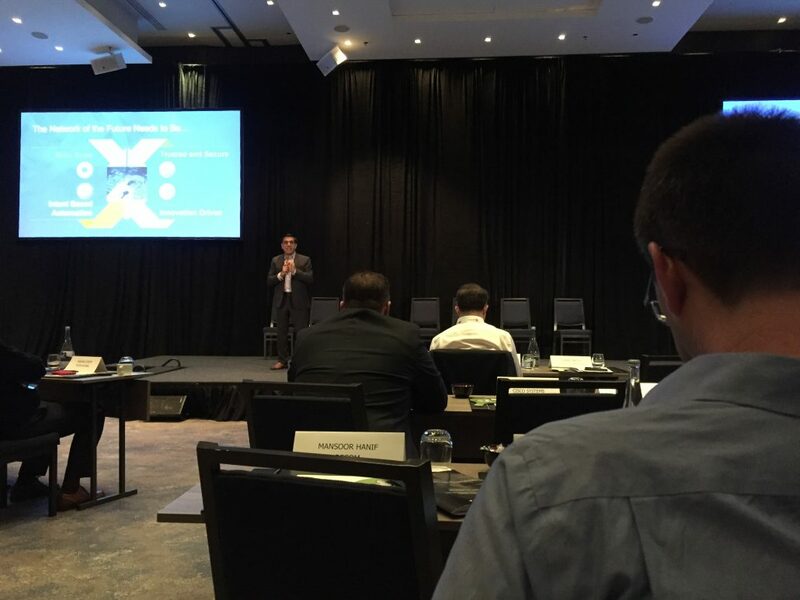 The 2020 Vision Executive Summit, presented by Light Reading, was focused mainly on the pending revolution of 5G networks, automation, Edge Computing, IoT, security, etc. It hosts a variety of vendors and service providers, who provide insights into the telecom industry’s current trends and emerging topics. 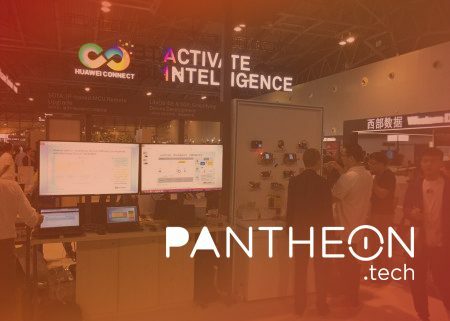 In case of 5G, we have seen a huge opportunity in discussing PANTHEON.tech’s future involvement and plans in this revolution. 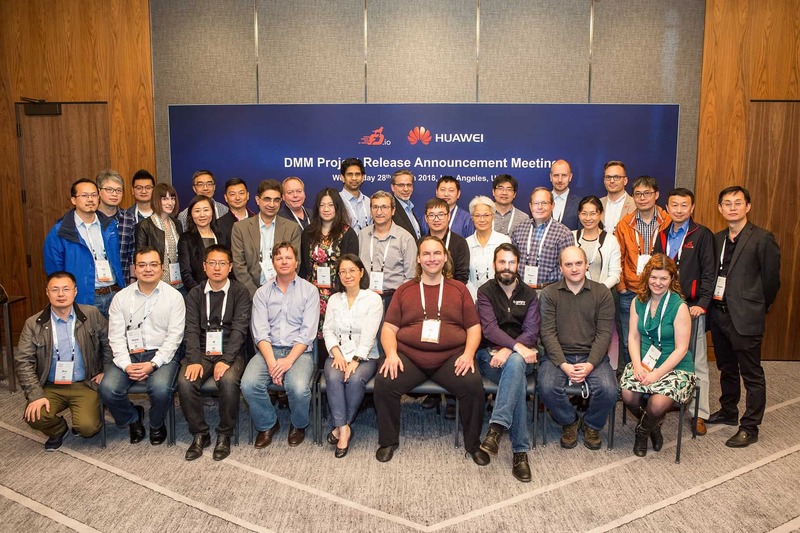 The challenges surrounding 5G were discussed by industry leaders with hands-on experience. This was beneficial, since we were confronted with the harsh reality of 5G. Due to it being a technology in-progress, many questions are still open. What will be the use-cases? What should we prepare for and when? Nobody really knows how it may turn out, when it will become widely available for consumers, or if the world is even prepared for it. But it was a great opportunity to meet the people, whose bread and butter consists of building the future 5G network. 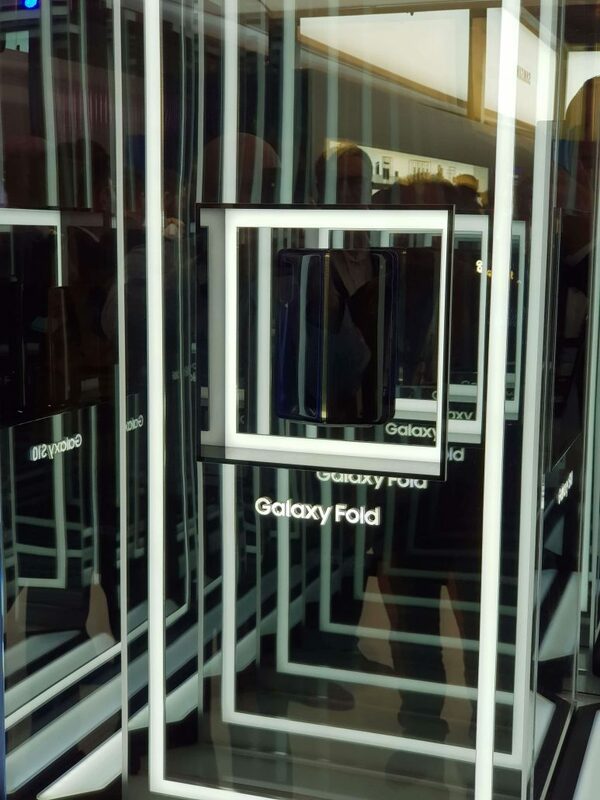 It was an invaluable experience, to see a realistic view from industry-insiders and their perception of the future. It was a collective of equally-minded individuals and companies in the fields relevant to PANTHEON.tech’s vision. Another heavily discussed topic was security. While it is no secret that technology is successfully becoming an important part of our lives. Companies have to heavily rely on a defense against potential security threats and cyber attacks. Panels were held regarding the importance of security measures in expanding networks and the need for flexible and agile security solutions. 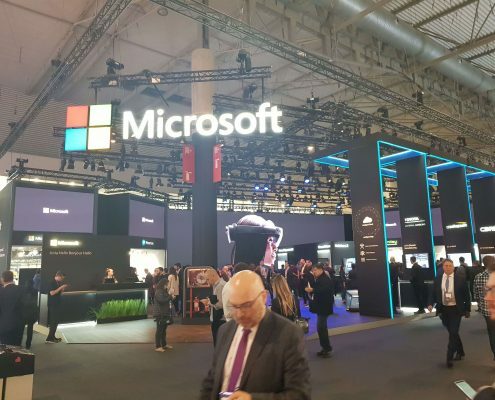 Subsequently, Edge Computing, which brings the distribution of data closer to the consumer, was also mentioned and discussed, in regards to its vulnerabilities and future. In this case, it was said with certainty that if you are the type of parent that plans your child’s future for them, make them study cyber security. The investment will return sooner than you could imagine. 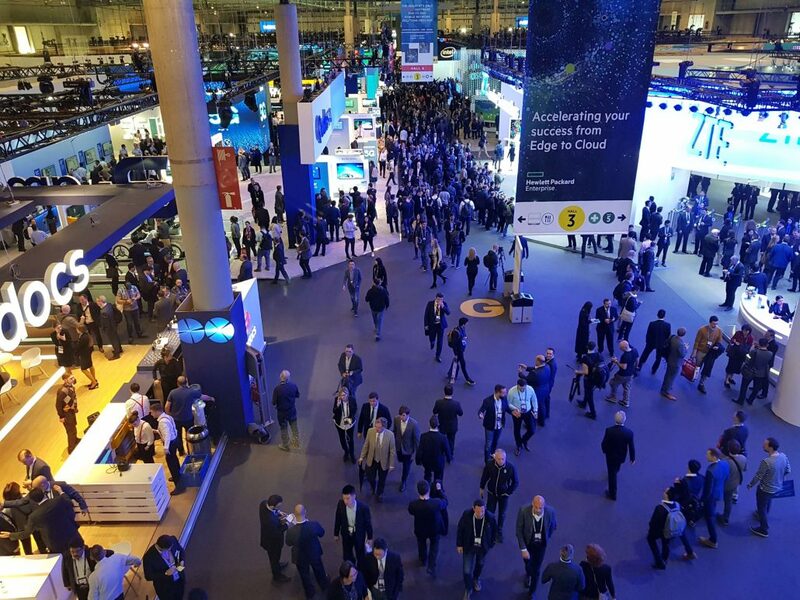 Our vision in attending this summit was to find out, if this summit is the right fit for us (spoiler alert – it was) check on the newest trends in our field and in which direction are they developing. The discussions were open and involved the real thoughts and views, without the PR and marketing stuff. Lisbon is an interesting city, since it is more hidden from the eye of a classic tourist. It reminded me, in a way, of San Francisco. This was mainly due to trams riding uphill and the many uphill roads one has to take, in order to get somewhere. It was surprising though, that the city is making it a point to keep the original architecture of the city in tact and without major reconstructions. As for the venue itself, the Intercontinental Hotel in Lisbon was nothing short of wonderful. 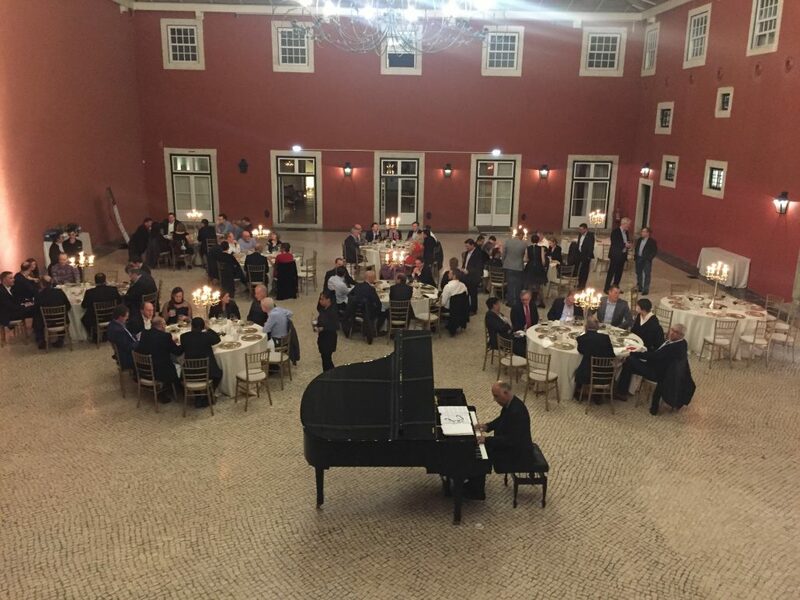 Another highlight was the gala dinner. 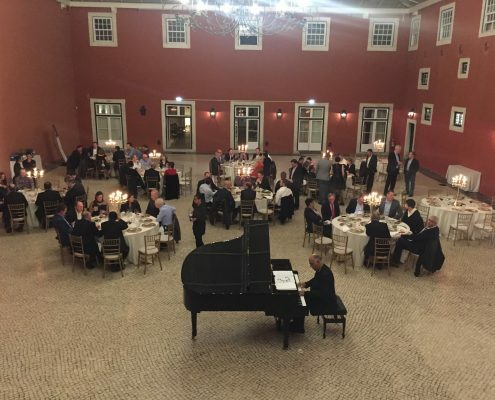 It was the perfect opportunity for casual networking, in the pompous and spectacular setting of Palacio de Xebregas. I have also experienced my first tuk-tuk ride, where I had to consider whether my life was worth the visit. In conclusion – it was. 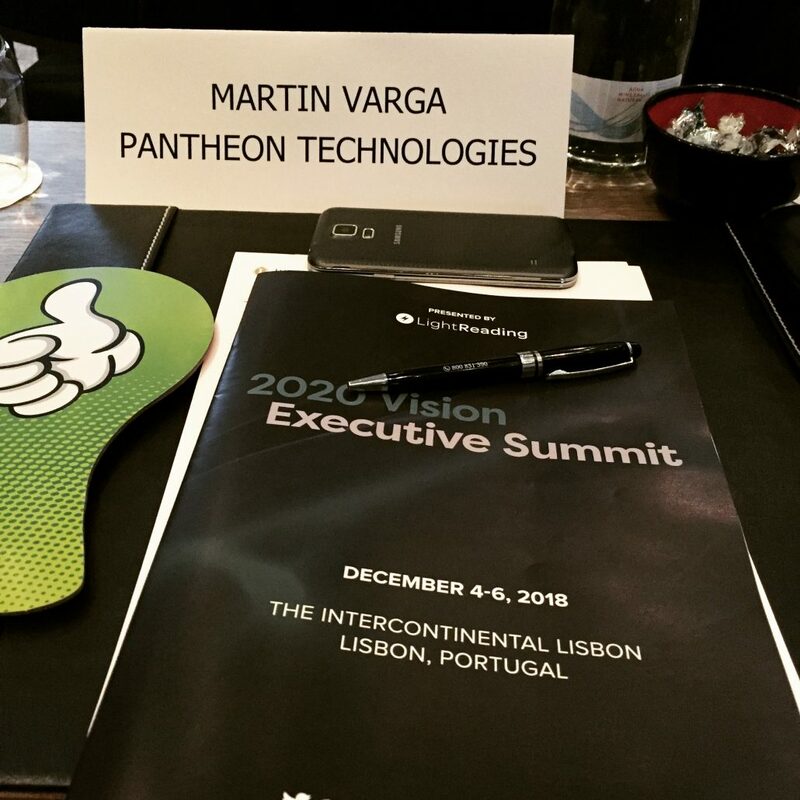 I am looking forward to the new business-partners and connections PANTHEON.tech has made at the 2020 Vision Executive Summit. lighty.io is an SDK that provides components for the development of SDN controllers and applications based on well-established standards in the networking industry. 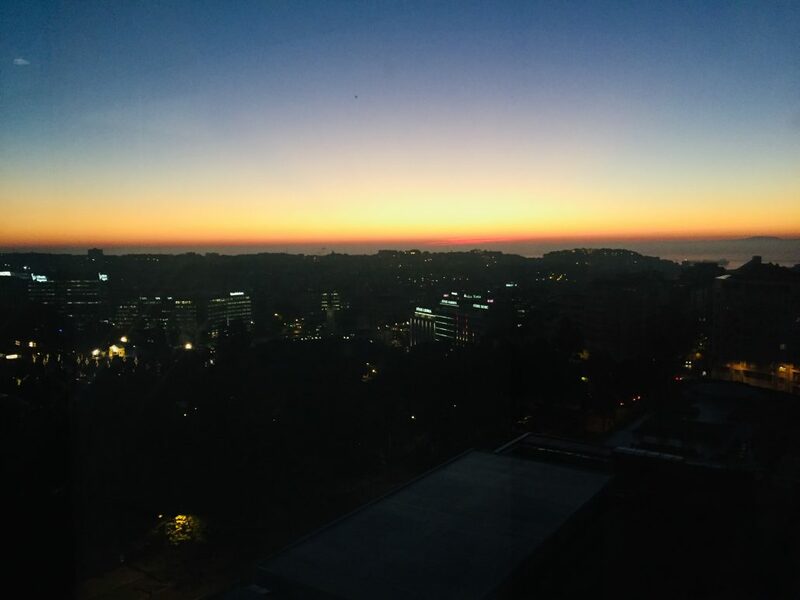 It takes advantage of PANTHEON.tech’s extensive experience from the involvement in the OpenDaylight platform and simplifies and speeds up the development, integration, and delivery of SDN solutions. lighty.io also enables SDN programmers to use ODL services in a plain JavaSE environment. 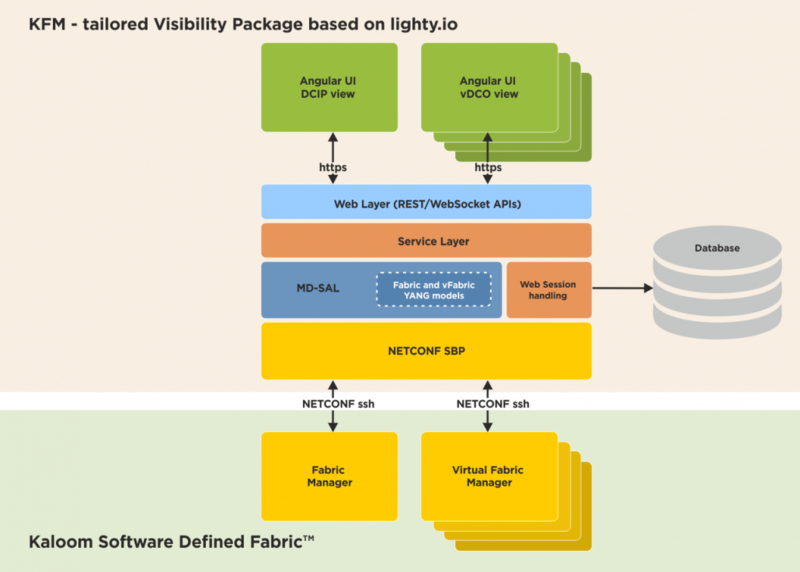 lighty.io enables a major OpenDaylight distribution vendor to build and deploy their applications faster. FRINX UniConfig provides a common network API across physical and virtual devices from different vendors. 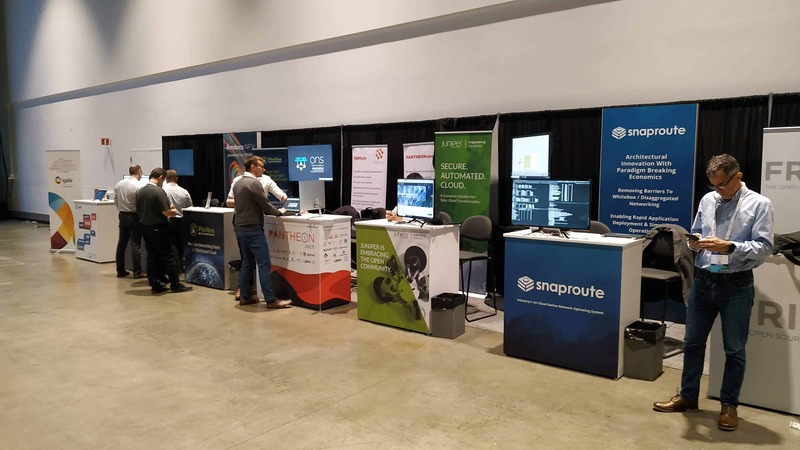 It leverages an open source device library, which offers connectivity to a multitude of networking devices and VNFs. The API provides the ability to store intent and operational data from services and devices, enables to commit intent to the network, syncs from the network so that the latest device state is reflected in the controller, compares intended state and operational state and provides device and network wide transactions. All changes are applied in a way that only those parts of the configuration that have changed are updated on the devices. The UniConfig framework consists of distinct layers, where each layer provides a higher level of abstraction. APIs of the lowest layer provides the ability to send and receive unstructured data to and from devices. The unified layer provides translation capabilities to and from OpenConfig. The UniConfig layer provides access to the intent and the actual state of each device plus the capability to perform transactions and rollback of configurations. NETCONF devices can be configured via their native YANG models or via OpenConfig. Finally, FRINX UniConfig also provides service modules based on IETF YANG models for the configuration of L2VPNs, L3VPNs and enables the collection of LLDP topology information in heterogeneous networks. The UniConfig Framework is based on open source projects like OpenDaylight and Honeycomb. It publishes all translation units under the Apache v2 license. Customers and integration partners can freely contribute, modify and create additional device models, which work with the UniConfig Framework. How did PANTHEON’s lighty.io help? PANTHEON.tech’s lighty.io helped to make UniConfig run and build faster. Porting UniConfig to lighty.io required no changes to the application code and has brought many measurable improvements. UniConfig now starts faster, has a smaller memory footprint, and most importantly – significantly reduces build time. FRINX offers solutions and services for open source network control and automation. 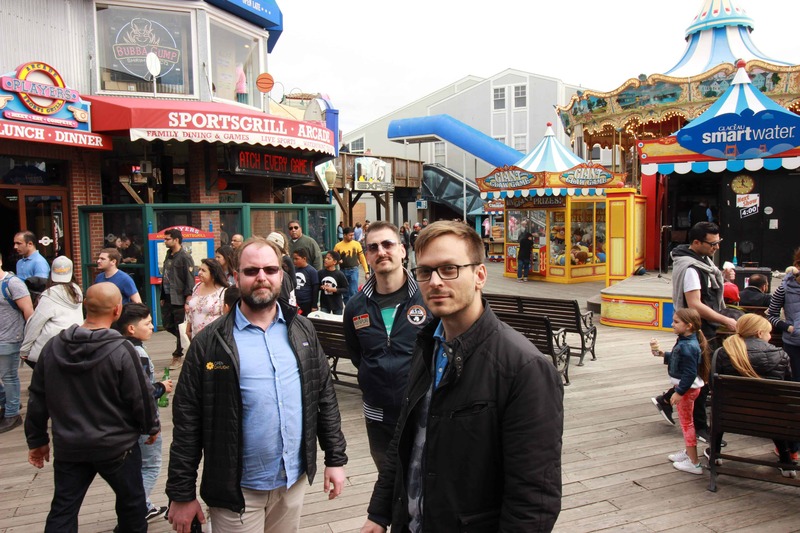 The team is made up of passionate developers and industry professionals who want to change the way networking software is created, deployed and operated. 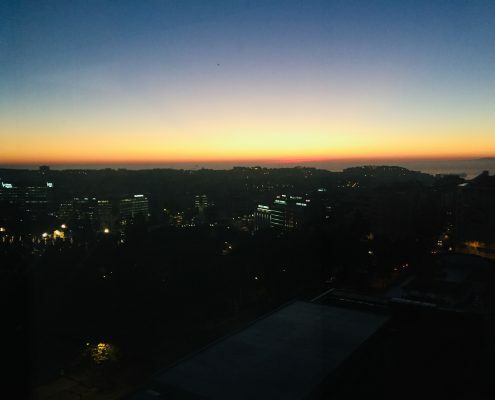 FRINX offers network automation products and distributions of OpenDaylight and FD.io in conjunction with support services. They are proud to count service providers and enterprise companies from the Fortune Global 500 list among its customers. PANTHEON.tech is a software research & development company focused on network technologies and prototype software. Yet, we do not perceive networks as endless cables behind switches and routers. For us, it is all software-defined. Clean and neat. Able to dynamically expand and adapt according to the customer’s needs. We thrive in a world of network functions virtualization and arising need for orchestration. 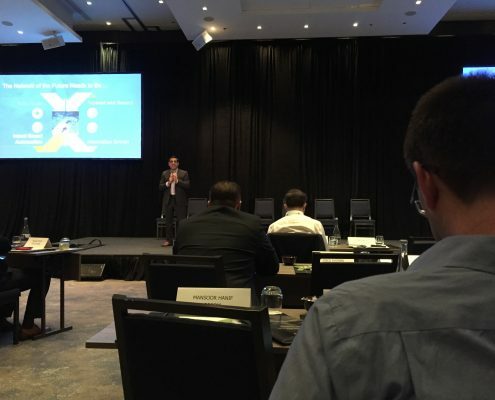 Focusing on SDN, NFV, Automotive and Smart Cities. Experts in OpenDaylight, FD.IO VPP, PNDA, Sysrepo, Honeycomb, Ligato and much more. In April 2018, the xRAN forum released the Open Fronthaul Interface Specification. The first specification made publicly available from xRAN since its launch in October 2016. 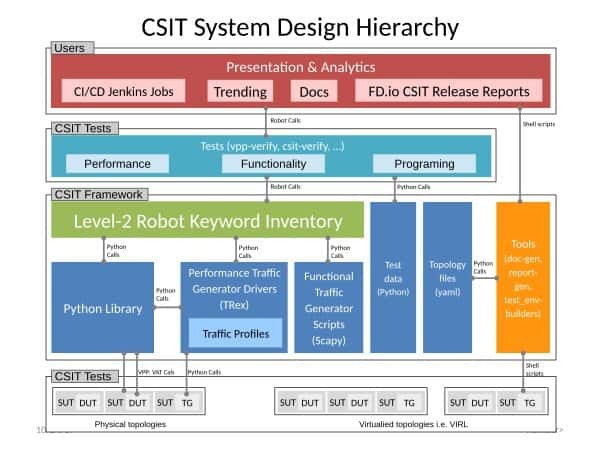 The released specification has allowed a wide range of vendors to develop innovative, best-of-breed remote radio unit/head (RRU/RRH) for a wide range of deployment scenarios, which can be easily integrated with virtualized infrastructure & management systems using standardized data models. This is where PANTHEON.tech came to the scene. We became one of the first companies to introduce full stack 5G compliant solution with this specification. Just a few days spent coding and utilizing the readily available lighty.io components, we created a Radio Unit (RU) simulator and an SDN controller to manage a group of Radio Units. Now, let us inspect the architecture and elaborate on some important details. We have used lighty.io, specifically the generic NETCONF simulator, to set up an xRAN Radio Unit (RU) simulator. xRAN specifies YANG models for 5G Radio Units. lighty.io NETCONF device library is used as a base which made it easy to add custom behavior and 5G RU is ready to stream data to a 5G controller. *We used device xRAN-performance-management model for this purpose. 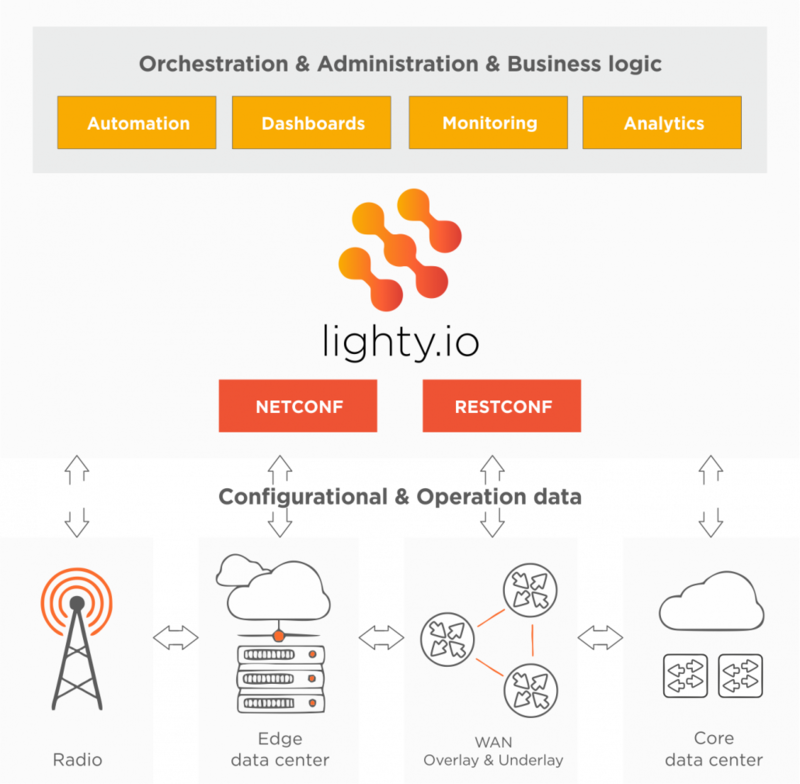 With lighty.io we created an OpenDaylight based SDN controller that can connect to RU simulators using NETCONF. Once RU device is connected, telemetry data is pushed via NETCONF notifications to the controller, and then directly into Elasticsearch. Usually, log stash is required to upload data into Elasticsearch. 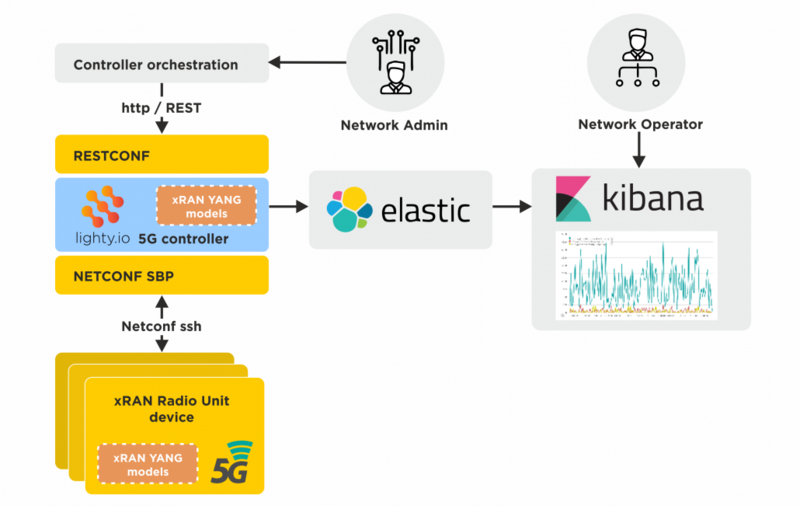 In this case, it is the 5G controller that is pushing device data directly to Elasticsearch using time series indexing. *We used xran-ald.yang model for this purpose. The lighty.io 5G controller is also listening to notifications from the RU device mentioned above. Data collected by the lighty.io 5G controller via RPC calls and notifications are pushed directly into Elasticsearch indices. Once indexed, Elasticsearch provides a wide variety of queries upon stored data. Typically, we can display several faulty frames received from “Antenna Line Devices” over time, or analyze operational parameters of Radio Unit devices like receiving and transmitting input power. Such data are precious for Radio Unit setup, so the control plane feedback loop is possible. How do we see the future of xRAN with lighty.io? 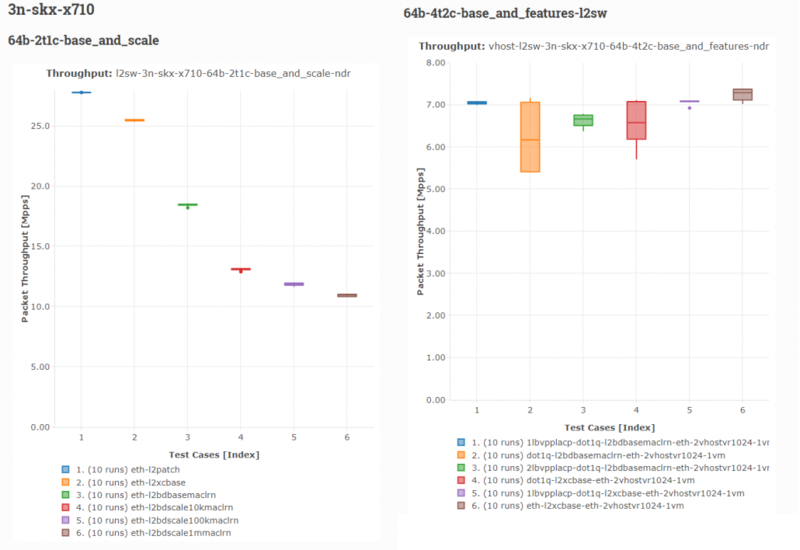 The benefit of this solution is a full stack xRAN test. 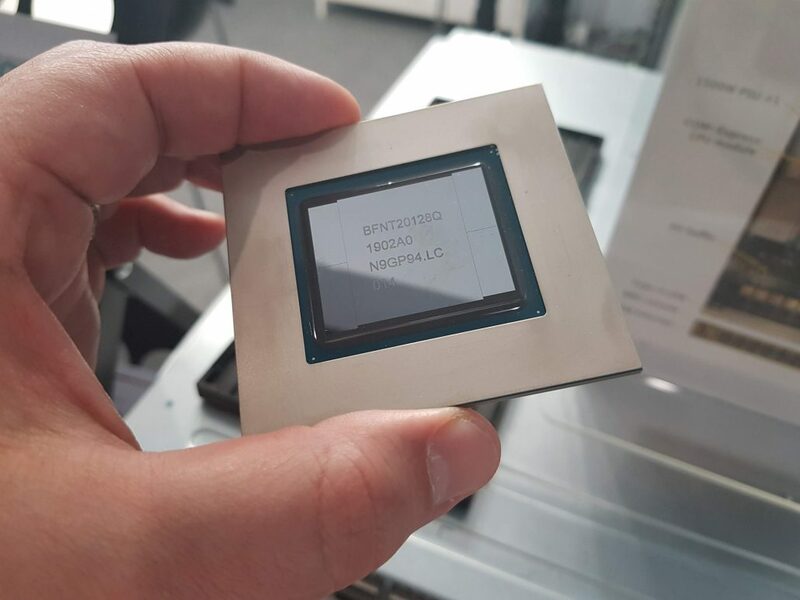 YANG models and its specifications are obviously not enough considering the size of the project. With lighty.io 5G xRAN, we invite the Radio Unit device vendors and 5G network providers to cooperate and build upon this solution. Having the Radio Unit simulators available and ready allows for quick development cycle without being blocked by the RU vendor’s bugs. lighty.io has been used as a 5G rapid application development platform which enables quick xRAN Radio Unit monitoring system setup. We can easily obtain xRAN Radio Unit certification against ‘lighty.io 5G controller’ and provide RU simulations for the management plane. Visit lighty.io page, and check out our GitHub for more details. Pantheon.tech had developed a network topology visualization component to be used to develop a responsive and scalable front-end network topology visualization application on top of the lighty.io. The topology visualization component enables you to visualize any topology on any device with a web browser. It will also be included within the lighty.io distribution package. We as a successful software development company were compelled to create our own solution based on the technologies we know and like to use as the other existing commercial applications fail to cover the visualization of the network topology sufficiently. 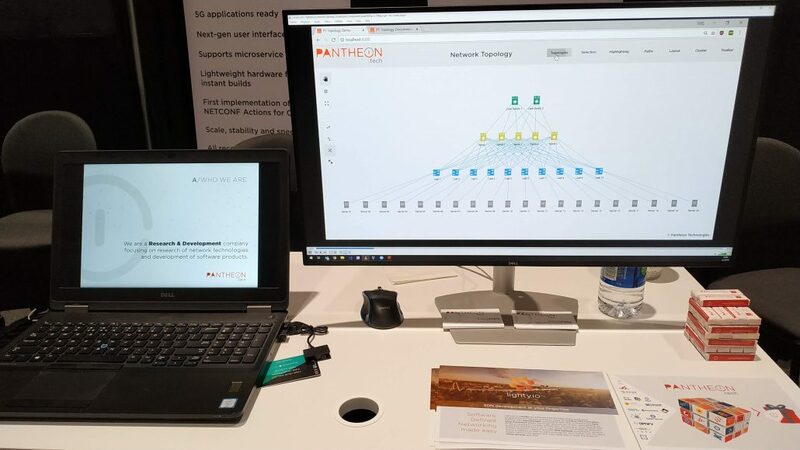 The experience of the development of Visibility Package, which is a software component,used to gather and visualize network topology data from different networks, network management systems,and cloud orchestrators, led Pantheon developers to create abetter solution.Using this the network topology visualization component will significantly reduce your time spent for the development. We have developed the topology visualization component as an Angular component, which can be used in Angular applications to create network visualization applications. 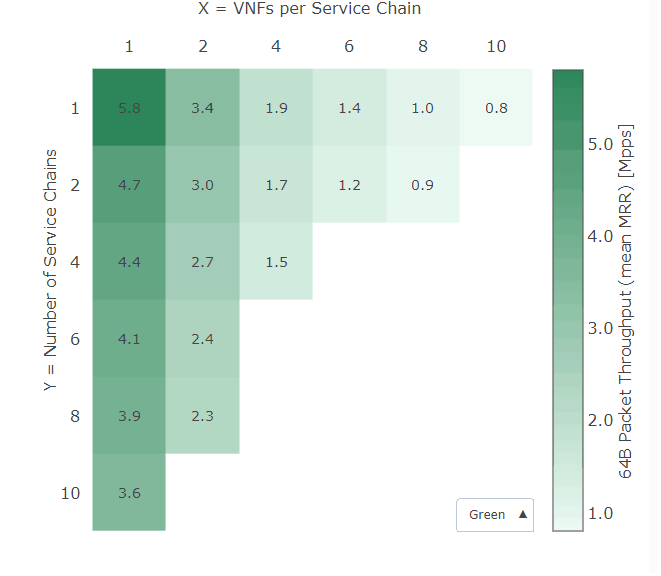 Thanks to its modularity, customizability the network visualization component can visualize any network from small company networks to large-scale data centers with thousands of nodes and links. Picture(1): A screenshot of a spine leaf network visualization sample. As every use case’s demands, requirements, and scale widely differ from each other, a scalable and universal component was needed. That is why we have based the topology visualization component on the Angular framework, which allows rapid development of responsive, modular and scalable applications. Our previous experiences showed us that SVG technology for topology visualization is not performing well with very large network topologies. That is why we decided to use HTML5 Canvas instead. Canvas provides seamless animations and has great responsiveness even with thousands of nodes and links. The topology visualization component includes extensive documentation and examples to help the developer while application creation. With Angular CLI, a basic application can be set up in minutes. The basic application could easily be customized to a desired state. We have developed the topology visualization component with customization in mind. The topology visualization component is developed as separate modules. The developer can decide and use which modules are needed for a particular project and add other modules whenever they are required. Angular and HTML5 Canvas are used to ensure even with large amounts of data the application will be running effortlessly. The topology visualization component works with small network topology with few nodes and links but truly shines with large-scale topologies. We are continually adding new features based on our client’s requests and needs. Watch this space out for many exciting features to be announced in the near future. How lighty.io can speed up the 5G connectivity deployment! lighty.io is a Software Development Kit (SDK) which provides components for the development of Software Defined Networking (SDN) controllers, based on commonly used standards in the networking industry. We have used our experience from the OpenDaylight (ODL) to create lighty.io, which will empower you to simply develop, integrate and deploy a tailored SDN controller. An SDN controller plays an essential role as an orchestrator of networking infrastructure in 5G networks. It is used not only for the configuring and monitoring of the physical routers and switches, but also for managing virtual networks of Virtual Machines (VMs) and containers. Among many great benefits of an SDN controller (or set of interconnected SDN controllers) is that it has a holistic view of the network. An SDN controller is also used for connecting User Equipment (UE) or Customer Premise Equipment (CPE) to data centers and enables technologies such as network slicing and edge computing to be used in the 5G. 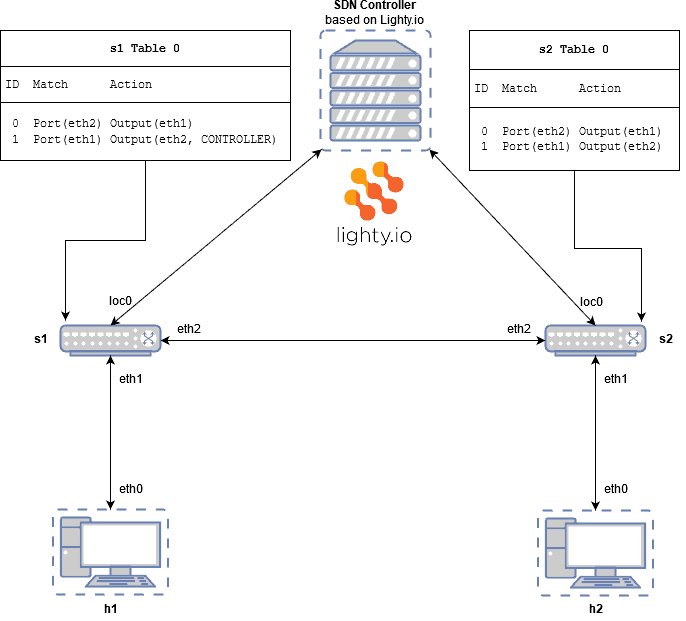 Network slicing requires the ability of configuration and monitoring of all networking devices (physical or virtual) along the path of the traffic. 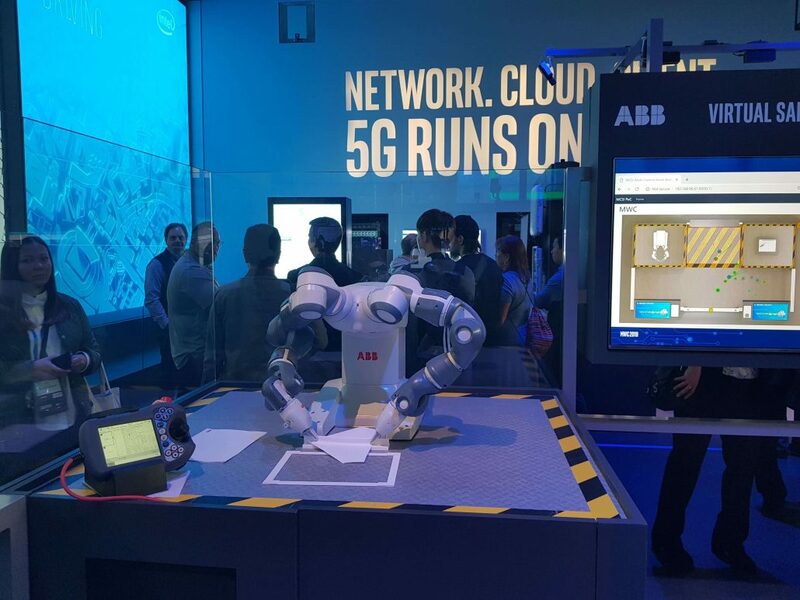 For edge computing purposes, it is necessary to automate the configuration of the devices in order to support 5G scenarios such as UE registration. The SDN controller enables technologies such as network slicing and edge computing to be used in 5G. Figure 1 (above) shows how the SDN controller based on lighty.io uses southbound plugins to read and write configuration and state of networking devices of WAN network and physical or virtual networks in data centers both core and at the edge. lighty.io supports many south-bound protocols for network orchestration, such as NETCONF and RESTCONF protocol plugins. The number of vendors and devices supporting these protocols grow every year. We believe that many devices and appliances in Radio, Edge, and WAN will speak these protocols in the 5G era. lighty.io also contains Pantheon’s SNMP SB plugin for integration with legacy systems, and for heterogeneous environments where the old and the new mix. The modular architecture of lighty.io allows adding new plugin implementations to other protocols. lighty.io exposes the configurational and operational data of all the devices to an upper layer where a business logic of administration and automation applications can be implemented. The APIs can also be accessed remotely via the REST API and other communication methods can also be implemented as northbound plugins. These upper layer applications can be designed as micro services or as a part of the SDN controller. As mentioned above, it is necessary to use an SDN controller also for orchestration of virtualized networks in data centers. An open source project FD.io is one particular example of using such technology. 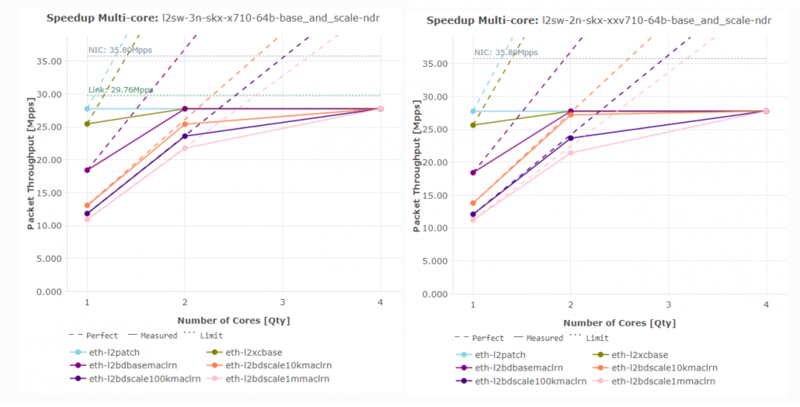 FD.io implements configurable data plane running in user space level, not in kernel space level. Thanks to this feature, the FD.io data plane can be deployed as an ordinary micro service e.g., as a container. FD.io can be used for interconnection of containers or VMs in data centers and it is possible to orchestrate all of the instances of FD.io by lighty.io based SDN controller. This way the 5G networks will enable adoption of IoT in everyday human life. The number of IoT devices expected to connect to internet in upcoming years is substantial. According to Gartner’s predictions, IoT technology will be in 95 percent of electronics by 2020 . According to another forecast from Cisco, 50 billion devices would connect to the internet by 2020 . The modular architecture of southbound plugins allows implementation of communication with physical and virtualized networking devices. Configurational and operational data of all orchestrated devices is exposed as a northbound plugin for administration, automation and analytics purposes. NETCONF and RESTCONF southbound plugins are available and field-tested. SNMP plugin for integration with legacy systems is also available. 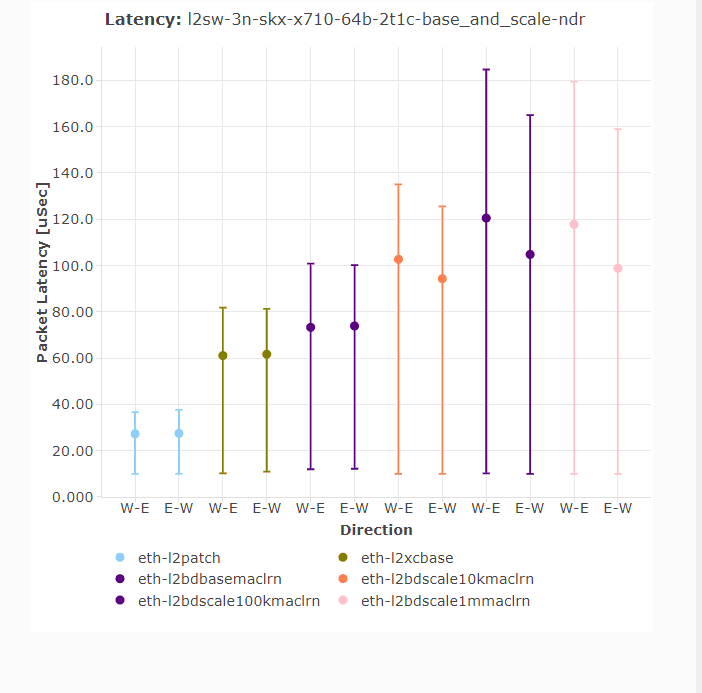 NETCONF protocol can be used by lighty.io for orchestration of FD.io data plane to interconnect VMs or cloud-native applications in data centers. lighty.io has a light weight hardware footprint, hence responds promptly. lighty.io is ready for micro service environment. lighty.io provides faster and cheaper testing and CI. lighty.io is an easy tool to develop and deploy SDN in 5G networking infrastructures. Ready to test how lighty.io works? Send us an email at sales@lighty.io and we will provide you with a trial version. 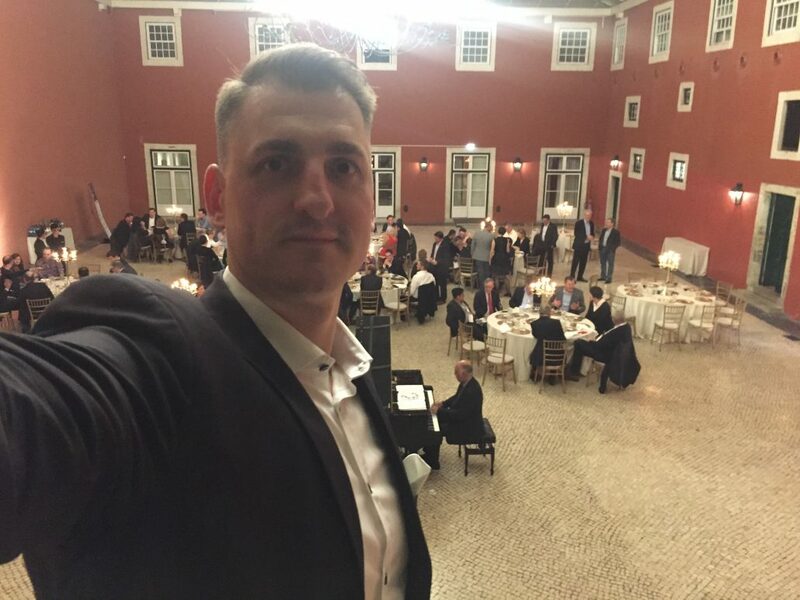 PANTHEON.tech had a unique opportunity to participate on Open Networking Summit (ONS) 2018 this year. 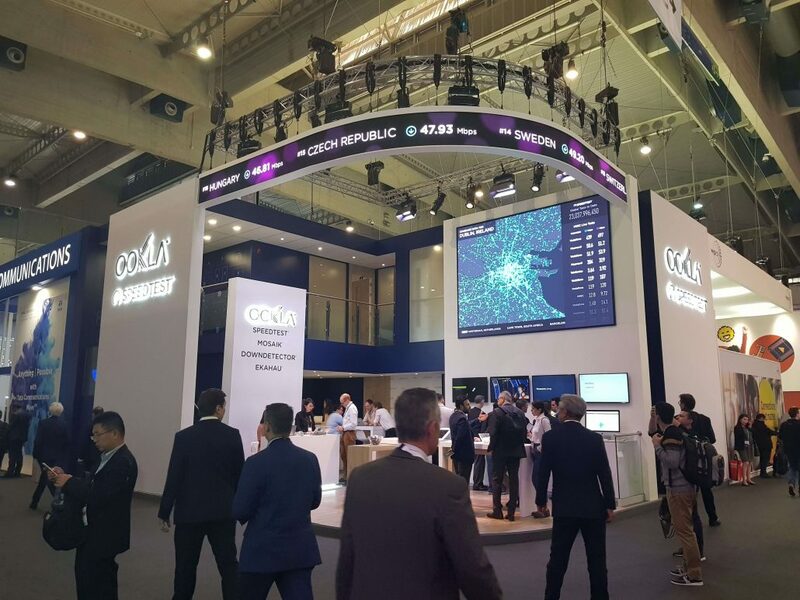 Central topic of the ONS 2018 was data center solutions: ONAP and Kubernetes based systems. Also few new projects under the wings of Linux Foundation were introduced. For example “Acumos AI“, “Arkaino Edge stack” and DANOS (Disaggregated Network Operating System project) which is the operating system for white-box switches. PANTHEON.tech has traditionally participated on the OpenDaylight (ODL) as well as the fd.io development and we launched our lighty.io product in the ONS. 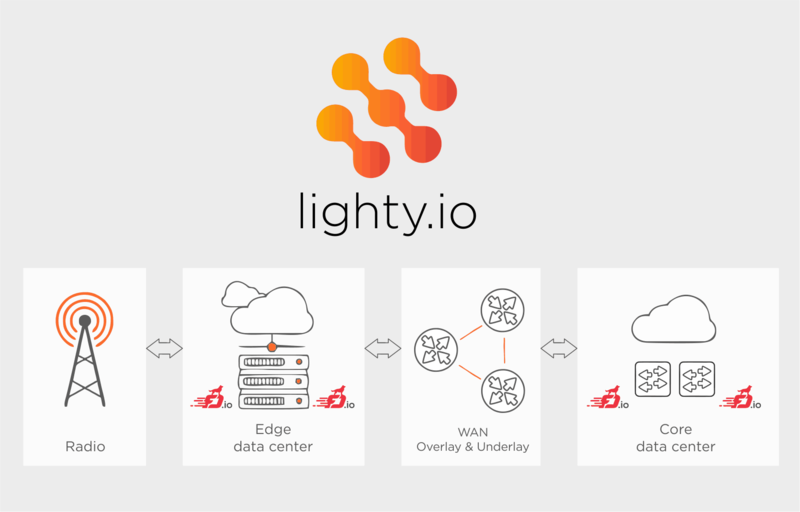 lighty.io changes conventional OpenDaylight attitude on how to build SDN controller applications, making them smaller, nimble and micro-service ready. One of the projects, in which we participate in the community, is The Fast Data Project (FD.io). For the FD.io community, we presented Ligato; Honeycomb’s younger brother. It is an ’easy to learn and easy to use’ integration platform. We love to see, that the FD.io community is growing larger, not only in the number of contributors, but in the number of projects and use-cases as well. We were also pleased to accept an invitation to an introduction of a new FD.io project “Dual Modes, Multi-Protocols, Multi-Instances” (DMM), where we discussed use-cases and integration paths from the current networking stack. FD.io community has a potential of further growth, especially as we see the shift of the networking industry from a closed-sourced hardware-based network functions to an open-source software-based solutions. 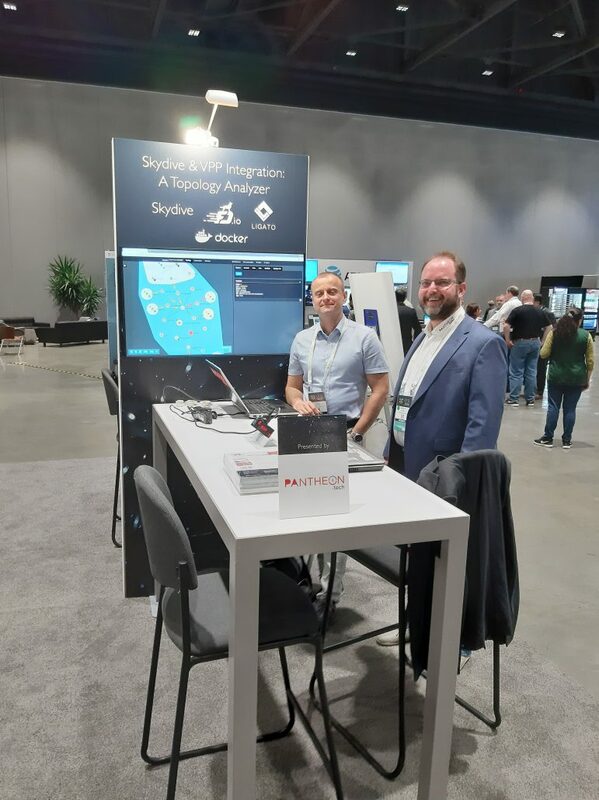 ONS 2018 was an exciting opportunity for us. It was a forum where we could easily share our knowledge and provide a much needed innovation. Let’s see how artificial intelligence and machine learning will change the landscape of networking in upcoming years. See you on next ONS event!